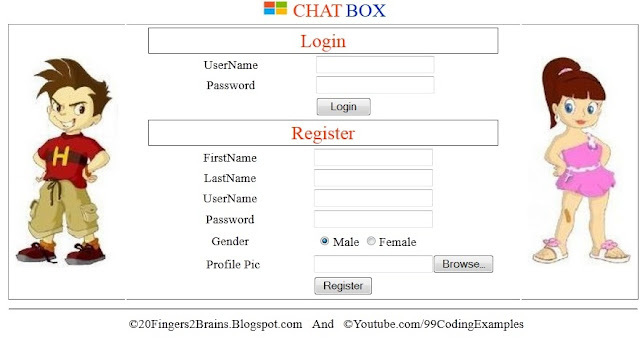 In this Open source Online chatting website project which i have named as ChatBox i have made a Multiuser friendchat system. SingalR chat project can also be made the same way. In this web chat system all registered users can do one to one chat with their friends who are online. 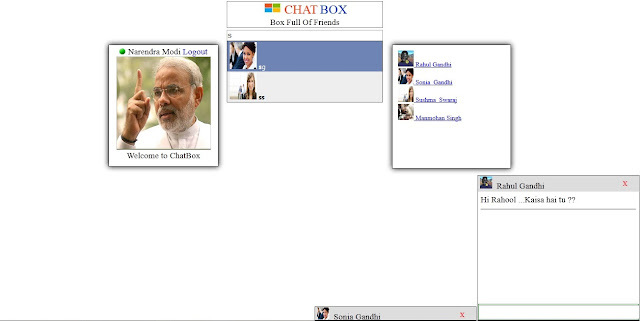 This chat made using asp.net c# can be integrated in social networking website project. cool chat project in asp.net looking forward to step by step explanation to create this chat application from scratch . Thanks can you please send me the code of this chat application. can you share me your soure code? Nice work buddy. Can you please me too a copy of the source code used and also some explanation on how you have accomplished this. Plz send your source to hoangdat@gmail.com. Thanks for sharing. Brother I also need its code. I want source code of this chat..i need this to include in my web site project..can you plz send me code at my email..
Can you plz send me the chat application source code to my email id..
nice work can you please email the concept shahid.ali@outlook.com thanks in advance. Hi please share me the scorce code of this. thanks in advance. I need help on Chatting application. Can you please send me full source code to my mail address sanakkia@gmail.com. Plz send your source to kamaleshs48@gmail.com. Thanks for sharing. Could you pleas share with me your source code?! Thanks! Nice work.Plaese send me the source code. Hello, You are a great programmer, Excellent work. Can you please send me the source code of this article. My email is tariq.aziz80@gmail.com. Could you please send me source code of this application on my email id : ketan.agnihotri@i11pl.com ? good work mate so if its open source then let us give it a try where is the source ? hee plz snd me code of this project. I need to implement this in my web application. Can you please send the code to my email? j.a.jacinto.oliveira@gmail.com. can you please send me the source code..
shall you please send the source to shamnadkannur@gmail.com ?? Can I get the source code please patriksaha@gmail.com? Please help me Chat module is very important for me. Plz send me the source code of this project. pls send me the source code of this chat application. Please mail me source code of this chat application.. raval.soni@gmail.com. Can you send me this projecdt on my mail id kuldeeps2105@gmail.com its very urgent. Can you please send me the chat application source code to my email helder.m.neto@gmail.com. I want source code of this chat..i need this to include in my web site project in asp.net..can you plz send me code at my email anushakolli835@gmail.com. I want source code of this chat..i need this to include in my web site project in asp.net..can you plz send me code at my email rahulsingh725@gmail.com. Excellent application.. please send me the source code with DB tables to my gmail. Hope that you wil send the code..... thank you. Please, send me code to nguyenvantruongitvn@gmail.com. Thanks! Hope that you will send the code.. Thank in advance. Please, send me code to congnguyentk@gmail.com. Thanks!!! Wow! This is very neat. I am attempting a similar under taking at codelogically.com. Please also send me the source code at aschaal1263@gmail.com. I would really, really appreciate it! your project very well and impressive, can you share the code for me for learning purpose? thanks.